One of the oldest names in British hi-fi, Tannoy is currently part of the Danish TC Group and is probably best known for its unique Dual Concentric single-chassis two-way drive unit technology, which first appeared way back in 1948. This £2,500 per pair DC8 is a simple two-way design and the smallest of three Definition models. As the name suggests, an eight-inch (200mm) Dual Concentric 'double drive unit' is at its heart, firing a 25mm titanium dome tweeter with 'tulip waveguide' horn-loading through the centre of a 145mm flared paper bass/mid cone with a conventional rubber roll surround. A bonus of the construction, of course, is that the tweeter is automatically well protected from prying fingers. The crossover network components have received Deep Cryogenic Treatment (DCT), which involves cooling key components slowly to around -190 degrees Centigrade, then restoring them equally slowly to room temperature, a process believed to relieve micro-mechanical stresses created during manufacturing. Twin terminal pairs are fitted for bi-wiring or bi-amping and internal wiring is silver-plated, high purity copper. A fifth terminal allows the driver chassis to be earthed to the amplifier, to reduce RF interference, though in practice five-conductor speaker cables are very hard to find. A large port is also mounted on the narrow rear panel. Although the shape is rather unconventional – significantly taller and shallower than usual – the enclosure has notably clean, contemporary lines and is beautifully finished in real wood veneer or black, all covered in good-quality high-gloss lacquer. A wide silver trim ring around the driver and a shaped silver strip across the lower edge provide decoration and the grille is held in place by concealed magnets. The carcase is actually made from birch plywood and extensively braced. The sides are strongly curved towards a much narrower back, so that reflections and internal horizontal standing waves should be pretty well dispersed. While the DC8 didn't top the lists, it did settle unanimously into a solid and second place in the listening tests. Speed and timing were its particular strengths and the voice balance was also considered very natural. Dynamics are lively and involving and music is reproduced with genuine passion, but also a measure of coloration in the lower registers. Above all, this is a fun loudspeaker, if not a strictly neutral one and the good size main driver undoubtedly helps bring fine expression to the party. 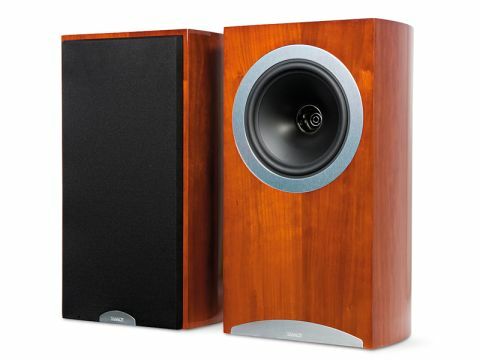 Tannoy's Dual Concentric approach has several significant consequences. One panelist correctly identified its 'point source' precision and it was abundantly clear that this speaker has unusually good coherence and a seamless crossover transition, with a lively and open presence band. Furthermore, because the horn-loaded treble radiates as a 90-degree cone, with narrower treble dispersion compared to conventional direct radiating designs, the relative amount of room-reflected treble is somewhat reduced, so the stereo imaging is exceptionally precise, with good depth perspectives. Not without character, this is nevertheless a fine loudspeaker, which looks great and does most things very well.